Immunoprecipitation of β-catenin from HeLa cell extracts. Lane 1 is 10% input, lane 2 is Rabbit (DA1E) mAb IgG XP® Isotype Control (Sepharose® Bead Conjugate) #3423, and lane 3 is β-Catenin (D10A8) XP® Rabbit mAb (Sepharose® Bead Conjugate) #12475. Western blot analysis was performed using β-Catenin (D10A8) XP® Rabbit mAb #8480 as the primary antibody and Mouse Anti-Rabbit IgG (Light-Chain Specific) (D4W3E) mAb (HRP Conjugate) as the secondary antibody. For western blots, incubate membrane with diluted primary antibody in either 5% w/v BSA or nonfat dry milk, 1X TBS, 0.1% Tween-20 at 4°C with gentle shaking, overnight. NOTE: Please refer to primary antibody datasheet for recommended Primary Antibody Dilution Buffer and recommended antibody dilution. Prestained Protein Marker, Broad Range (Premixed Format): (#7720). Mouse Anti-Rabbit IgG (Light-Chain Specific) mAb. A general protocol for sample preparation is described below. Lyse cells by adding 1X SDS sample buffer (100 μl per well of 6-well plate or 500 μl per plate of 10 cm diameter plate). Immediately scrape the cells off the plate and transfer the extract to a microcentrifuge tube. Keep on ice. Sonicate for 10–15 seconds for complete cell lysis and to shear DNA (to reduce sample viscosity). Heat a 20 μl sample to 95–100°C for 5 minutes; cool on ice. Load 20 μl onto SDS-PAGE gel (10 cm x 10 cm). NOTE: CST recommends loading prestained molecular weight markers (#7720, 10 μl/lane) to verify electrotransfer and biotinylated protein ladder (#7727, 10 μl/lane) to determine molecular weights. Electrotransfer to nitrocellulose or PVDF membrane. (Optional) After transfer, wash nitrocellulose membrane with 25 ml TBS for 5 minutes at room temperature. Incubate membrane in 25 ml of blocking buffer for one hour at room temperature. Wash three times for 5 minutes each with 15 ml of TBS/T. Incubate membrane with Mouse anti-Rabbit IgG (Light-Chain Specific) mAb (1:2000) in 10 ml of blocking buffer with gentle agitation for 1 hour at room temperature. Incubate membrane with Anti-mouse IgG, HRP-linked antibody (#7076) (1:2000) and Anti-biotin, HRP-linked Antibody (#7075) (1:1000) to detect biotinylated protein markers in 10 ml of blocking buffer with gentle agitation for one hour at room temperature. 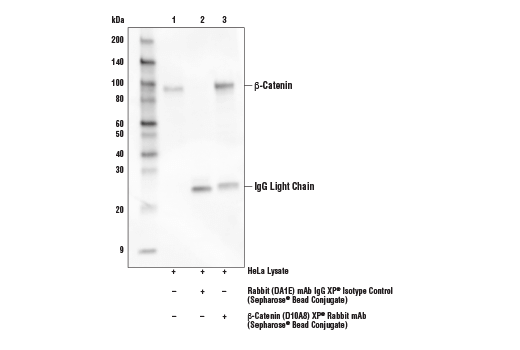 Proceed to detection step in section D.
Mouse Anti-rabbit IgG (Light-Chain Specific) (D4W3E) mAb (HRP Conjugate) recognizes the light chain of rabbit IgG, either in its native conformation or in its denatured and reduced form. It does not bind to the denatured and reduced rabbit IgG heavy chain (about 50 kDa) on western blot. Mouse Anti-rabbit IgG (Light-Chain Specific) (D4W3E) mAb (HRP Conjugate) only reacts with the light chain of rabbit IgG and does not bind to the denatured and reduced rabbit IgG heavy chain. When performing immunoprecipitation (IP) followed by western blotting, the denatured rabbit IgG heavy chain of the primary antibody used for IP runs at approximately 50 kDa on the subsequent western blot and can often obscure bands of proteins that have a similar molecular weight. Using Mouse Anti-rabbit IgG (Light-Chain Specific) (D4W3E) mAb (HRP Conjugate) as a secondary antibody will eliminate this problem. Sepharose is a registered trademark of GE Healthcare.